Common Name: Purslane, Portulaca, Verdolaga, Pigweed, Little Hogweed, or Pusley. Properties & Taste: Sour and cold. Meridians: Large intestine and liver. Indications & Combinations: Dysentery manifested as fever, abdominal pain, blood and pus in the stool and tenesmus. 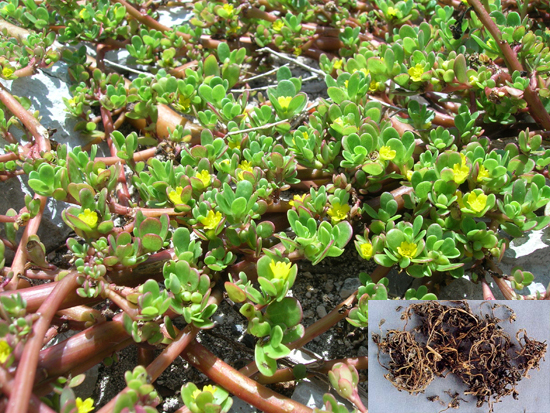 Portulaca (Machixian) is used with Scutellaria root (Huangqin) and Coptis root (Huanglian). Also, Portulaca (Machixian) can be taken alone as treatment for these symptoms. Dosage: 30-60 g If the juice is used fresh, the dosage can be doubled. Contraindications and Cautions: Contraindicated during pregnancy, and in cases of cold from deficiency of the spleen and stomach. Toxicity and Overdose: This section is being researched, and is not completed.